Keep in mind that this is not a press conference, but an affidavit submitted to a court. It is no longer a matter of just making information known, but this is a written sworn statement of fact voluntarily made by Mr. Zullo under an oath which is administered by an authorized person to do so by law. There is much that we have covered here at FreedomOutpost.com in regards to Obama’s eligibility. We’ve covered his background on a number of issues as well as the fraud of his birth certificate and history. The affidavit is far too long for a simple article, so we are making it available for you to read through. Without further ado, here is the complete text of the affidavit, along with relevant images. You may also download a PDF copy of the affidavit here. BETH CHAPMAN, SECRETARY OF STATE, et al. In August 2011, some 250 citizens of Maricopa County, Arizona, petitioned Maricopa County Sheriff Joseph Arpaio to investigate allegations that President Obama’s identity documents were forged. They further alleged that by endorsing the forgeries, Mr. Obama had raised questions about his constitutional eligibility to hold the office of President. The Maricopa County Sheriff’s Office is an Arizona State Certified Law Enforcement Agency, Headquartered in Phoenix Arizona. Maricopa County is the fourth largest county in the United States, and has a total area of 9,224 square miles. And has a population of over four million. Deputy Sheriffs of the MCSO are delegated their law enforcement authority by the Maricopa County Sheriff. Sheriff Joseph M. Arpaio became Sheriff in 1992 and has been reelected to an unprecedented sixth term in office. He began his career as a federal narcotics agent infiltrating drug organizations from Turkey to the Middle East to Mexico, Central, and South America to cities around the U.S.
His expertise and success led him to top management positions around the world with the U.S. Drug Enforcement Administration (DEA). He concluded his remarkable federal career as head of the DEA for Arizona. Arpaio has over five decades experience in law enforcement. Under the Arizona Constitution and Arizona Revised Statutes, the elected Sheriff of Maricopa County has the authority to request assistance from a volunteer posse to assist the Sheriff in the execution of his duties, working under law enforcement authority of the Maricopa County Sheriff. Upon activation by the Maricopa County Sheriff, certified Posse members are empowered to act as if the Sheriff himself were present when called upon to do so. Posse members of the MCSO are delegated their law enforcement authority by the Maricopa County Sheriff. Under that activation Sheriff Arpaio granted fully law enforcement authority of the Maricopa County Sheriff’s Office to conduct this investigation and to report back to the Sheriff our findings for his ultimate dispensation. In October of 2006, Sheriff Arpaio ordered the creation of the MCSO Cold Case Posse (CCP). At his personal request I accepted appointment as commander of this unit. I have served in this capacity for the last seven years. The purpose of the CCP was to assist Maricopa County Sheriff’s Office in investigations including active and Cold Case Homicides. Since its inception, the CCP has been placed under the guidance and control of The General Investigation Division. The MCSO Cold Case Posse consists of hand selected individuals with diverse skills consisting of professional experiences in conducting investigations, including individuals with backgrounds in Law Enforcement, Insurance Fraud Investigations, Military Service, Physicians, Computer Information Systems, Corporate CEO’s, as well as attorneys who have participated in criminal and or civil litigation. Sheriff Arpaio referred the complaint to his Cold Case Posse, directing myself as Lead Investigator to review the evidence, to determine whether and to what extent the complaint had merit, to investigate further in due course as necessary, and to report directly to Sheriff Arpaio. A five-member team of experienced investigators was expressly selected. It included former police detectives and attorneys (whom have received additional investigational training by Maricopa County Sheriff’s Office) who worked voluntarily and at virtually no expense to the taxpayer. Sheriff Arpaio referred the complaint to his Cold Case Posse, directing myself as Lead Investigator to review the evidence, and to determine whether and to what extent the complaint had merit. We were to investigate further as necessary, and report to Sheriff Arpaio. Sheriff Arpaio expressed that it was his goal to clear the document as authentic and move the country forward. He also required that the investigation be thorough and absent of any political ideologies, and that it be performed with the utmost care and diligence. The investigators were also directed to review all background documentation provided by the petitioners in relation to their complaint, and to consider all other information obtained or developed during the normal course of the investigation. The petitioners suggested that the Sheriff’s Office should start by contacting Dr. Jerome Corsi, an investigative journalist who had written a book in search of Mr. Obama’s original birth certificate document and had amassed a substantial body of evidence. Dr. Jerome Corsi was unknown to the investigators prior to this investigation. Subsequently, we spent 16 hours interviewing Dr. Corsi, who agreed to turn over to us for review all of the information he had on file. At the conclusion of Dr. Corsi’s interview I determined that Dr. Corsi’s work, (with the exception of a copy of the down loaded .pdf file released by the White House on April 27, 2011) was to be treated as “investigational information” only and not to be considered as evidence. The basis for this decision was due in part to the fact that some of the information presented by Dr. Corsi was a compilation of research performed by other individuals. In addition Dr. Corsi was in communication with these individuals prior to meeting with us and these individuals were yet unknown to our investigators. To preserve the independence and integrity of our investigation Dr. Corsi’s information would be utilized as investigative background information only. Dr. Corsi worked closely with our investigation as an informational source until July 2012. Dr. Corsi suggested that we should contact a nationally recognized computer expert, Mara Zebest, who has served as a contributing author and technical editor for more than 100 books on Adobe and Microsoft software. Ms. Zebest was contacted and invited to participate in a two-day investigational meeting, to which we invited five other participants: investigators, attorneys, and professionals in computerized graphic design, IT professionals, and a physician. None had any prior familiarity with the White House computer image document. During that meeting, all aspects of the document were examined with the intention of attempting to disprove the allegation that the document had been fabricated. This included a review of the work of an author by the name of John Woodman. John Woodman, a struggling, self-described computer expert, had authored a book putting forth explanations on how computer software automatically caused the anomalies contained in the White House document. Mr. Woodman’s work had been cited vigorously by numerous media outlets attempting to disqualify allegations suggesting that the .pdf document offered by Mr. Obama was anything but authentic. The theories set forth in Mr. Woodman’s book were thoroughly tested by investigators and found to be nothing more than pure speculation and supposition. The investigators concluded Mr. Woodman’s work was nothing more than conjecture without any evidentiary proof that his theories could be supported. When investigators put his theories into practical application, they could not successfully reproduce any of the anomalies found in the White House document by automated computerized process. Therefore Mr. Woodman’s work was dismissed as irrelevant and offering zero evidentiary value. At the end of the two-day event, all investigational information concerning the .pdf file was presented was intensely tested and deliberated. All in attendance agreed unanimously that the White House computer image .pdf file contained anomalies that were unexplainable unless the document had been fabricated piecemeal by human intervention, rather than being copied from a genuine paper document. This conclusion also served to contradict the alleged chain of events surrounding the production of the document, as put forth by the White House and the Hawaii Department of Health. Investigational findings thus far were reported back to Sheriff Arpaio. Having informed Sheriff Arpaio that the document appeared to be a fabricated forgery and that violation of Arizona criminal statutes and federal statutes may have taken place, it would be essential to continue the investigation. Sheriff Arpaio agreed and investigators began to pursue further investigation of the .pdf file and related events surrounding the creation of the document. This serves as an outline of our work, preliminary results, and preliminary conclusions to date. As of the date of this report, this investigation remains open and ongoing and additional forensic evidence continues to be uncovered further validating the original investigational findings. Investigators studied Mr. Obama’s “short-form” Hawaiian birth certificate that became public in 2008; the “long-form” certificate endorsed by Mr. Obama at a White House press conference on April 27, 2011, and then posted as an electronic computer image at www.whitehouse.gov (no physical document was produced); and the selective service registration card allegedly signed by Mr. Obama on July 30, 1980. We interviewed several persons, consulted many experts, tested and evaluated computer evidence using related software. In early in 2012, I informed Sheriff Arpaio of our preliminary findings. I reported that after extensive examination of the electronic document, the computer image released by the White House on April 27, 2011, and examination of Mr. Obama’s Selective Service registration card, that we believed there was probable cause to suspect Mr. Obama’s identity documents were in- fact forged. 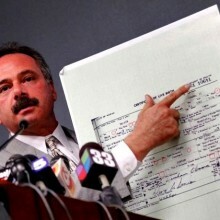 The Sheriff held a press conference on March 1, 2012, to announce the findings that investigators had concluded that the document released on April 27, 2011, by the White House of Mr. Obama’s long form birth certificate was a computer generated fraud created exclusively by human intervention and not by the actions of random computerization. The press conference served to attract further evidence, and to give us an opportunity to present an outline of our reasons. On March 1, 2012, Sheriff Arpaio held a press conference during which he and I presented an outline of those aspects of the investigation that would not compromise the safety of witnesses or the integrity and future course of the investigation. At that time, we announced that we had concluded that there was probable cause that forgery and fraud had been committed in respect of two documents: 1) the long-form or original birth certificate computer image presented by Mr., Obama, which contained multiple errors and anomalies, many of them serious and: 2) the selective-service document for Mr. Obama, which contained a two-digit year-stamp. This was contrary to specifications issued by federal regulation to the effect that the year of issue should be expressed as four digits on the stamp, and also contrary to any other selective-service registration document that we had been able to examine. I visited Hawaii twice and continued our investigation. After further in-depth computerized testing and discovering additional information, we concluded in mid-2012 that Mr. Obama’s identity documents were not only forged beyond the legal standard of probable cause, but due to loop holes in the state of Hawaii’s vital statistics reporting laws, there was the distinct evidence suggesting that Hawaii’s statutes appeared to be in conflict with federal immigration law and posed an independent threat to the national security of the United States. After three months of further investigation, the Sheriff held a second press conference to announce, with my support, that there was no longer a question of mere suspicion but that of probable cause. It was now demonstrated beyond probable cause that the document presented to the public by Mr. Obama and placed on the White House website was an utter forgery. In addition, Sheriff Arpaio reported concerns that Hawaii’s statutes appeared to be in conflict with federal immigration law and the birth registration policy in Hawaii posed a threat to national security. Sheriff Arpaio stated at both press conferences that we are not in a position to conclude either that Mr. Obama himself has committed any offense or that he was born outside the United States, nor that he is constitutionally ineligible to seek or hold the office of President of the United States. However, the fact that most if not all of the identity documents are forged supports the complainant’s allegation that Mr. Obama, in endorsing and posting a forged birth certificate image on the White House website, has raised legitimate questions that should now be investigated by Congress. Sheriff Arpaio also announced that the investigation would continue, and it has continued ever since. As the investigation continued, various national and local media attempted to disqualify the investigative findings by fostering alternative explanations for the documents irregularities. Opponents made nothing more than superficial explanations alleging that the Obama documents irregularities were simply caused by nothing more than the automation processes of computer software. However, the media failed to put forth any investigative evidence to validate their theories, which were soundly defeated by over 1,200 independent computer software tests conducted by investigators. Investigators wanted to determine the probability that a document containing the plethora of irregularities as found in the computer image Obama presented could still be genuine. Taking it a step further, investigators sought an independent authority on forensic document examination that had no previous connection with our inquiry. Investigators commissioned a court certified handwriting analyst and forensic document examiner with over 20 years of experience providing document expertise to legal and law enforcement communities, corporations, financial institutions and private individuals for this task. Investigators requested an independent review of our findings in respect to the long-form birth certificate image that fell within his field of expertise. Investigators have determined beyond probable cause that the computer image released on April 27, 2011 by the White House, and purporting to be a true computer copy of Mr. Obama’s long form birth certificate, is not a scan of an original hard copy document. It is, in fact, an undeniable computer generated forgery created with the sole intent to deceive the public by commission of felonious fraudulent acts. Sheriff Arpaio’s investigators have determined the document ( the .pdf file released by the White House) was created entirely by human intervention, and not by the actions of random computerization. As such, the White house computer image cannot be relied upon as bona fide factual record of the birth event that it attempts to depict. Our investigation has also concluded that the method used to fabricate the document was by means of human logic and the distinct manual placement and distribution of electronic data between nine distinct computer generated “layers”. This type of layering is entirely uncharacteristic of a paper document that, when scanned, results in a simple, digitized, single layer photographic image. Investigators in particular focused on the registrar stamp bearing the signature of Hawaii States Registrar Dr. Alvin T. Onaka. This stamp was found to be comprised of external objects that were imported into the document, created uniquely for the forgery of the Obama birth document, by an intentionally deceptive cut-and-paste process. This fact alone is sufficient to render the entire document void of any probative value. Our investigational findings soundly defeated the only two attempted explanations of the anomalies on the computer generated long-form birth certificate image offered for justification: OCR (Optical Character Recognition) and/or Optimization (Compression of the files in order to reduce the file size). Investigators attempted to recreate the anomalies found in the computer generated image by tedious implementation of the some 1200 computerized tests, and were unable to recreate the anomalies contained in the White House .pdf file. Investigators clearly demonstrated that neither could account for the myriad discrepancies found in the White House image. Subsequently, this is supported by an independent expert forensic examination confirmed the electronic computer image of Barack Obama’s long form Certificate of Live Birth, released by the White House on April 27, 2011, is in fact a forgery, thus supporting the initial findings of our investigation. Therefore Mr. Obama has in fact not offered any verifiable authoritative document of any legal significance or possessing any evidentiary value as to the origins of his purported birth narrative or location of the birth event. In addition investigators have determined that the White House .pdf file displaying a manufactured image of Mr. Obamas purported Hawaiian birth certificate could not survive judicial scrutiny or be offered as documented evidence, certified by the State of Hawaii, as proof attesting to the event and therefore could not be accepted as such in any judicial proceeding. As such, this computer manipulated fraudulent image cannot be deemed as acceptable legal evidence for the purpose of validation or verification of identity or citizenship, or serve as verification of a birth event by any Secretary of State in the confines of the United States. Mr. Obama has not released any evidence other than a manufactured computer forgery by human intervention and design in an effort to support his claim of his birth taking place at Kapiolani Hospital, Honolulu, Hawaii on August 4, 1961. Additionally, Hawaii State Statues and Hawaii Department of Health policy do not authorize the Hawaii Department of Health to create a computer generated .pdf file as an officially certified document severing as a verification of a live birth event. The very creation this .pdf file runs in direct conflict with the Hawaii Department of Health’s own admission declaring they released two paper copies of a “Birth Document” to the President’s attorney Perkins Coie partner Judith Corley on April 25, 2011. According to copies of letters released by White House officials, Judith Corley initiated the process and traveled to Hawaii to pick up two photo copies of Mr. Obama’s long form birth certificate, not an electronic .pdf file. The two copies released to Judith Corley have never been made public. Investigators have also determined that the much touted 1961 newspaper announcements are in fact utterly unreliable as evidence to support verification of the event as depicted in the .pdf image of the manufactured birth certificate released by the White House and attested to my Mr. Obama. In addition the aforementioned announcements can be of no substitute for a Hawaii State Official Birth Certification and or Certificate. In summation, investigators believe that the computer image presented by the White House is an unabashed forgery, and thus could not survive even the lowest level of judicial scrutiny in any jurisdiction in the United States, and does not serve as evidence or certification of any such event. Furthermore, it cannot be used as an authenticated legal document for proof of citizenship, or proof to obtain a legitimate passport, or legitimate Social Security Identification Number. It most certainly cannot be relied upon as legitimate proof and verification of a live birth event by the residents of Maricopa County, the State Of Arizona, or in any jurisdiction within the United States. “Information” is not a verification of the document (.pdf file) as a whole. A fraudulently created document often times contains matching information on some level when compared to some other document of record, however, the fact that some information may match in a file does not verify the legitimacy of the document as a whole. In this case the .pdf image presented by the White House to the public, is in the appearance of what the unsuspecting public would perceived to be a true copy of an official document and therefore accepted on face value. This also includes the fabrication and appearance of green security paper background that one would expect to be used on such an official document. The creation and use of this background would solely be used to give the perception of authenticity in an official capacity. Further, Hawaii has not acknowledged that they ever created or released an electronic computer created .pdf file containing an image of the Barack Hussein Obama II Hawaii Certificate of Live Birth to the White House or to the attorney for Barack Hussein Obama II. They also did not verify how and when information may have been added or deleted for the original file and for what purpose. The PDF file posted on the White House website shows no evidence of a scan of a photocopied document ever taking place, but displays all the evidence of a manufactured file. An electronic image of the photocopied document as it would have been if the original document had been genuine would not have possessed the irregularities in the White House .pdf file that, in our forensic experts’ opinion, demonstrate that the image was pieced together electronically from multiple sources. One of our most serious concerns is that the White House document appears to have been fabricated piecemeal on a computer, constructed by drawing together digitized data from several unknown sources. The registrar’s signature stamp and the date stamp adjacent to it each appear independently on separate layers of the electronic image. Furthermore, these distinct layers contain no other data of any kind. Our experts have considered the possibility that the ink used for these two stamps might have been of a sufficiently distinct color to be distinguished from all other colors on an original paper document and thus isolated. However, we have concluded that no scan of an original document could produce such separation of individually distinct items into distinct layers with no other data on them. The registrar’s stamp appears to have been imported from another unknown source document. Investigators intently focused on the fact that the stamp cannot have been placed on the document pursuant to state and federal laws as one of many indications that the document is a forgery and, therefore, that it cannot be relied upon as verification, legal or otherwise, of the date, place or circumstances of Mr. Obama’s birth. The date stamp next to the registrar’s signature stamp exhibited a similar grave anomaly, allowing it to be moved about electronically within the document – which would have been impossible if the document were the scanned and certified copy that official statements profess it to be. We were particularly disturbed to find that the registrar’s date and signature stamps could be picked up and moved around the document at will, leaving behind a distinct white halo impression of the two stamps. On our test document, with a single layer and a single link, any manipulation of this kind was impossible. A close examination of the State registrar’s stamp on the electronic image of Mr. Obama’s birth certificate shows there are two different registrar stamps evident on the electronic image: (1) the date stamp, indicating April 25, 2011, and (2) the text and signature stamp containing Dr. Alvin Onaka’s signature. Both registrar stamps give the appearance of been applied by a rubber stamp inked from a pad. However, our experts determined that the registrar’s stamps are external objects that were imported into the document. The stamps were not impressions copied whole, but were created uniquely for the Obama document by a cut-and-paste process. The white area around the date stamp indicates the image is not a scan of a paper document but a computer-generated file fabricated electronically. That the registrar’s signature and date stamps were both created by links to external objects imported into the Obama birth certificate is also confirmed by turning on “Links” in the “Window” menu in Adobe Illustrator. The Registrar’s signature-stamp and date-stamp were computer-generated images that were imported into the document. They were not electronic images of actual rubber-stamp imprints inked by hand or machine on to a paper document. This can only be accomplished by human logic and intervention. Furthermore, the White House image displays a white “halo effect” around the letters, such that the texture of the paper cannot be seen underneath the ink, and the image noise is inconsistent throughout the document. As seen below, moving the two stamps leaves the white halo visible, indicating where the two external links had initially been pasted into the document. Registrar’s date and signature stamps separately rotated and repositioned on the White House image. The fact that the .pdf file contains evidence of the importation of the Official Hawaii Registrars Stamp and Date stamp and the fact that the Stamps can be picked up and moved about the document leaving a white background of its imported placed location should be evidence enough of tampering bringing the authenticity of the document completely into question. This fact alone provides sufficient evidence for any court certified document examiner to conclude and testify the entire document is fatally flawed and is void of any legal authority. Fraudulent Birth certificates created in Washing DC. President Obama’s White House technology czar Vivek Kundra, oversaw technology projects and budgets for 86 D.C. government agencies as head of the District’s Office of the Chief Technology Officer. Yusuf Acar, then acting head security officer for the D.C. Office of the Chief Technology Officer was arrested and ultimately sentenced to 27 months in prison in connection with a bribery scam by federal authorities in 2009. Assistant U.S. Attorney Thomas Hibarger told a federal judge that Acar, was a flight risk because agents seized $70,000 in cash in his house and because in recorded conversations, he boasted that he could easily flee to his native Turkey. Acar also told an informant that he could use computers to create fake D.C. birth certificates, Hibarger said. “Legitimate birth certificates provide vital information about the person whose name appears on the certificate. While originally intended for the sole purpose of birth registration, birth certificates are now used extensively for employment purposes and to obtain benefits or other documents used for identification. “A certified copy of a birth certificate is proof only that a birth occurred and was recorded. For that purpose, it may be desirable that the public be allowed easy access to them. However, the agencies and organizations that use birth certificates as proof of identification for employment purposes, to obtain benefits or other documents (e.g., driver’s licenses, Social Security cards, and passports), and to assist them in determining eligibility for public assistance and other benefits, may have concerns with how easily certified copies of birth certificates can be obtained. These conflicting perspectives are at the very heart of the birth certificate controversy”. questionable physical security situations that create opportunities for fraud; and limited oversight of local issuing entities by State vital records offices”. “Many agencies and organizations request that individuals provide their birth certificates to receive a benefit or service, or to support the issuance of other documents often used for identity purposes (e.g., driver’s license). Mr. Abercrombie has publicly stated that he was present when Mr. Obama was born. There is no evidence to support this claim. No doctor or nurse or persons who attended Mr. Obama’s birth has come forward to say so. No one has ever come forward to say he or she recalls having seen either Mr. Obama or his parents together at any social event when he was an infant. It is not surprising; therefore, that Governor Abercrombie later recanted that statement that he had seen Mr. Obama’s parents with their new-born so. He acknowledged that he had not seen them at any hospital, although he said he remembered having seen Mr. Obama as a child with his parents at social events. Once Mr. Abercrombie had become Governor, he told the Honolulu Star Advertiser on January 20, 2011, that he was searching within the Hawaii Department of Health to find definitive vital records that would prove Mr. Obama was born in Hawaii, because he feared the continuing eligibility controversy might hurt the President’s chances of re-election in 2012. This being the case, this document as reported would clearly be out of the chain of custody of the Hawaii Department of Health. Hence, the authenticity of that written record and the integrity of that record cannot be verified or sufficiently secured to prevent tampering. To date, the purported undisclosed birth record in the state archives that Governor Abercrombie has claimed to have discovered and has described as being “actually written” has never been made public. From Governor Abercrombie’s admission, it is legitimate to infer that this record, if it indeed exists, was not in the possession of the Hawaii Department of Health, which may have had no record of the in-country birth of Mr. Obama either in hard copy form, such as a long form birth certificate, preserved in a vault. If such a document had existed, Mr. Abercrombie would have had it within minutes of his request: for he had the right, as the senior official of the Hawaii administration, to examine it if he wished to do so. However, Governor Abercrombie, even after launching an exhaustive investigation, failed to produce the documentary evidence of Mr. Obama’s Hawaiian birth that he had said he would produce. In October, 2008, she said Hawaiian law forbade the issuance of certified copies of original birth certificates to persons with no tangible interest in the record, but added that she and Dr. Alvin Onaka, the Registrar of Vital Statistics, had personally seen and verified the original birth certificate “in accordance with state policies and procedures”. To this day, Dr. Fukino is the only person who has said publicly that she has personally inspected Mr. Obama’s actual birth certificate in a bound book in a vault at the Department of Health. Dr. Fukino’s statement confirms Governor Lingle’s own statement that she did not personally verify the existence of the original birth certificate, but relied solely on the representations of Dr. Fukino, whose statement also implies that a birth record of some kind exists and that she inspected it, though she provided neither a description of the document nor any verifiable information said to have been contained therein. Dr. Fukino says she was accompanied by Dr. Alvin Onaka, with whom she viewed the document. We noted that Dr. Onaka has never publicly confirmed that he had accompanied Dr. Fukino or that he had verified the existence of the document. Dr. Onaka has remained suspiciously silent on the matter to date. Under these circumstances, Dr. Fukino’s statement to the effect of a verification of an authentic “Long Form Birth Certificate” has little evidential value. Dr. Fukino also gave an interview to CNN on April 26, 2011, in which she stated that she simply went into the vault and inspected Mr. Obama’s original birth certificate. By inference, then, it should have been no more difficult for Governor Abercrombie to locate it as well. In July, 2009, Dr. Fukino said she had seen “the original vital records maintained on file by the Hawaii State Department of Health verifying Barack Hussein Obama was born in Hawaii and is a natural-born American.” Again this statement has no evidential value. As reported by Fox News, Dr. Fukino said that during her time as Director of Health for Hawaii Dr. Alvin Onaka, State Registrar of Hawaii, had moved Mr. Obama’s birth certificate from a file vault, where bound books containing vital records line the shelves in handwritten, leather-bound ledgers and placed inside the vault’s 5-ft-tall gray metal combination and key lock safe that holds money and other valuables. If so, Dr. Onaka could very easily have alerted Governor Abercrombie to its whereabouts. Mr. Onaka was the Register at that time. Presumably the document was in the same bound volume as the other 499 from that the year secured in his vault. The question becomes what happened to it when Governor Abercrombie came looking for it in 2011. Dr. Fukino said that Mr. Obama’s long-form birth certificate was preserved in a hard-covered bound volume along with the other long-form birth certificates of that period. This record – if it had existed – would have been easily obtainable from the Department of Health upon the Governor’s request. Dr. Fukino also said that Mr. Obama’s original Certificate of Live Birth was bound in a ledger containing 499 other certificates of people born in Hawaii in 1961. There were 500 sheets per book, and 35 volumes of 1961 birth records. The last series of digits in the registration number found on Hawaiian long form and current computerized-format birth certificates indicates which numbered volume contains the original document inside the health department’s first-floor vault. She explained that each of the bound volumes for the 1960s, including the one containing Mr. Obama’s birth certificate, had bright orange elasticized canvas covers with the birth year stamped clearly on the spine. Different colors were used for different decades. The last few digits in the registration number, which are correlated with the current computerized database of information taken from the original paper records, serve as a unique identifier allowing the volume containing the original certificate to be found immediately in the vault. Therefore, it should not have been at all difficult for Governor Abercrombie to locate Mr. Obama’s original long-form birth certificate by simply asking the Department of Health to look up the computerized record, check the certificate number, and instantly locate the relevant volume of paper certificates. His failure to locate the document raises the possibility that Mr. Obama’s birth record may not have been in the relevant orange-bound volume of 500 sequentially-numbered certificates, or that, if it is present, it did not show him as having been born anywhere in Hawaii. It is also possible that Mr. Obama’s birth registration was not recorded, or that the number on that registration did not correlate to his name in the Department of Health’s computerized database that has been in use since 2001. We noted that Dr. Fukino had changed the wording from viewing Mr. Obama’s “original birth certificate” (in her first statement) to having “seen the original vital records” (in her second statement). We later learned that Hawaiian law permits amendment of a birth certificate and the creation of a document file containing the sealed record of the original document and supporting documentation that authorized a change to the information contained in the original document. We also learned that an amended certificate would be distinctly marked alerting to the fact it was altered. The wording suggests that perhaps there was a file of some type located within the Department of Health containing additional information regarding this matter, permissible under Hawaii State Statutes. But the file may not have contained an original birth certificate identical to the electronic image on the White House website. Investigators found a high potential for fraud in the registration and issuance of Hawaii birth certification documents. It was discovered to be evident in: 1) lax statutory regulation and 2) through obscure evidentiary requirements in establishing factual verification of the information required in the reporting of legitimate births occurring within the state of Hawaii. In 1982, Hawaii revised a long standing statute (§ 338.17.8) allowing the issuance of birth certificates to children born out of state. Hawaii declares these foreign born children to be American citizens simply by virtue of an application by any adult making representations on behalf of the parents, and simply supplying documentation substantiating the parents had resided in Hawaii and paid income tax to the state Hawaii for one year prior to the birth of the child. Thus, by statutory provision, Hawaii has granted upon itself the unique power to confer citizenship to children not born in the United States, and to children not born to United States citizen parents, but to children actually born on foreign soil. [§338-17.8] Certificates for Children Born Out of State. Proof of legal residency shall be submitted to the Director of Health in any manner that the Director shall deem appropriate. The Director of Health may also adopt any rules pursuant to Chapter 91 that he or she may deem necessary or proper to prevent fraudulent applications for birth certificates and to require any further information or proof of events necessary for completion of a birth certificate. These implications of this law is evidenced by the discovery of correspondence between the Department of Health Director George Yuen, in support of the measure, and State Representative Herbert A .Segawa. The March 1st 1982 document clearly shows the effect this proposed Bill H.B. 3016-82 would it have become law. The document recognized the fact that the department would have to issue birth certificates to children worldwide if the child’s parents could prove they were in fact legal residents of the Territory or State of Hawaii. Legal residents as categorized by Hawaii tax code, not Untied States citizens. There is nothing in Hawaii Revised Statute § 338.17.8 to require that this birth certificate be marked as the child being born out of state, nor that was the child born within the United States or its territories. There is no requirement in this statute that at least one parent provide proof of United States citizenship. This section only requires a declaration (and proof which is not defined and is based upon requirements deemed appropriate by the Director) that the parents were residents of Hawaii. It does not require that the parents were citizens of the United States. By statutory provision Hawaii has granted upon itself the unique power to confer citizenship to children not born in the United States, and to children not born to United States citizen parents, but to children actually born on foreign soil. Conceivably, the parents and child may never have set foot on United States soil. Hawaii declares these foreign born children American citizens simply by virtue of an application of any adult, making representations on behalf of the parents and simply supplying documentation substantiating the parents had resided in Hawaii and paid income tax to the state Hawaii, for one year prior to the birth of the child. The authority to naturalize persons as citizens of the US is conferred upon the Attorney General only, not the State of Hawaii. It would appear that Hawaii Revised Statute § 338.17.8 is in direct conflict with the Immigration and Nationality Act, in that United States citizenship maybe be conferred to an individual who is not entitled to such citizenship. See I.N.A. §§ 301, et seq., which comprehensively regulates how a child born out of the United States acquires U.S. Citizenship. Even this would require at least on parent be a United States citizen at the time of the birth. This comprehensive regulation would clearly be meant to exclude any regulation in the area by the States. Arizona v. United States, 11-182 (June, 2012). Compulsory registration of births, authorized by Hawaii Revised Law §57-8 requires all births of be registered. It also permits the registration for an unattended birth to be accepted on the representation of only one of the parents. No other witnesses are necessary for a claimed unattended birth. Conceivably, a parent could have given birth outside of the U.S., and claimed that it was an unattended birth (no witnesses) in Honolulu. Local registrar to prepare birth certificate, authorized by Hawaii Revised Law §57-8 is bristling with the fraudulent potential by compelling the local registrar to prepare a birth certificate for an alleged unattended birth based solely uncorroborated testimony from anyone claiming to have had knowledge of the birth taking place. Under this statute, a birth could exist outside of the U.S., and any person could represent false information to the local registrar. The registrar is compelled to file the certificate. Additionally, there is no requirement for a parent or relative, providing identification to be present at time of registration. Any person, a relative, friend or stranger may registrar the birth of a child while both the mother and baby were outside of the country. There is no verification process and no way to be certain of the actual identify of the parents. Delayed or altered certificates, authorized by Hawaii Revised Law §57-18. Utilizing this Statute, a person may apply for a delayed or amended certificate having one year to do so from time of birth. There is no verification to determine why the registration is late. The Statute also allows any person “born” in the Territory of Hawaii to file or amend a certificate. This would include that any adult could claim their birth was never reported a decade later, file for a birth certificate. The validity of the three types of birth filings were so questionable that even Hawaii would not accept them as “Prima Facia Evidence”. This Statute would require the birth certificate be plainly marked, “Delayed”, or “Altered” and the probative value would determine by the official to whom the certificate was being offered. We believe it is safe to conclude that even the State of Hawaii did not have confidence in the representations on this document. Third, Mr. Obama represented to the residents of Maricopa County and the American public that a forgery was “proof positive” of his authentic 1961 Hawaiian long-form birth certificate, thereby deceiving voters and state election commissions across the country into believing he was eligible to become President, have his name appear on Presidential ballots, thereby garnering votes from the public under false pretenses. Accordingly, Sheriff Arpaio continues to recommend that the Congress of the United States open an immediate investigation, including the appointment of a select committee, as regards to the authenticity of Mr. Obama’s documentation, whether any crimes have been committed, and to determine Mr. Obama’s eligibility for the office of President of the Unites States. Investigators also examined Mr. Obama’s Selective Service registration card bearing Mr. Obama’s signature, which displays a Post Office Date stamp, “July 29, 80,” in the lower right corner. For comparison purposes, investigators reviewed a number of authentic Selective Service registration cards of other individuals, obtained via Freedom of Information Act requests. All the authentic registration cards the investigators inspected displayed a Post Office stamp indicating the calendar year date stamp with four digits, for example “1980″. This was in sharp contrast to Mr. Obama’s card which displayed a two digit date stamp of “80″ for the year. Investigators interviewed several Post Office employees who verified that it was standard procedure to utilize only a four digit date stamp. Investigators learned that the date stamp that would have been utilized in 1980 was identified as a Pica Post Office stamp set that could only be obtained through postal supply houses. Investigators located that particular stamp set but were unsuccessful in locating a four digit 1980 date stamp insert. Noticing irregularities in the date stamp, namely the date “80″ on Mr. Obama’s registration card, it is offset low and to right when compared to the full four digit “1980″ date stamps on other cards. Investigators believed that this anomaly was created by the severing of an intact four year “2008″ date stamp and inverting the remaining “08″ inverting it to cause it to display “80″. Investigators concluded that this representation of “80″ that appears on Mr. Obama’s selective service card is in fact an altered 2008 pica date stamp. Investigators obtained a 2008 Pica Post Office date stamp and severed it in between the two zeros. Then by inverting investigators were able to replicate an identical looking stamp to that one found on Mr. Obama selective service card. Investigators concluded that there is a high probability that Mr. Obama’s selective service card was recently created as an attempt to cover up the fact that Mr. Obama failed to register for Selective Service as required by law in 1980. There has been immense speculation that Mr. Obama may actually have been born in Kenya. These speculations were fuelled not only by the refusal of Mr. Obama to produce a valid Hawaiian birth certificate, but by recognition of the Kenya government claiming Kenya as being Mr. Obama’s birth place. There were numerous reports that Stanley Ann Dunham had reportedly left Hawaii to travel to Kenya in the summer of 1961 to give birth. In an attempt to verify whether Mr. Obama and his mother Stanley Ann Dunham had possibly arrived in the United States at or around the alleged date of his birth, we contacted the National Archives to obtain microfilms of the immigration landing records (I-94 document) for the calendar year 1961. Investigators focused on microfilm records of INS passenger cards for foreign flights arriving in Honolulu during the time period of July 1961 through September 1961. We discovered that data records for the entire week of August 2, 1961 through August 7, 1961, were completely missing from the microfilm roll. This included the alleged date of Mr. Obama’s birth (August 4, 1961). Investigators also examined Mr. Obama’s Selective Service registration card bearing Mr. Obama’s signature. They concluded that there is a high probability that Mr. Obama’s selective service card was recently created as an attempt to cover up the fact that Mr. Obama failed to register for Selective Service as required by law in 1980. 1961 August 4, 7:24 pm – Barack Hussein Obama II was allegedly born in Kapiolani Hospital, Honolulu, HI, according to the image of his long-form birth certificate that is posted on the White House website. Birth certificate number 61-10641. However, this has been greatly debated due in part to initial reports that Mr. Obama was reports to have been born in Queens Medical Center, in Honolulu Hawaii. Inquiries were made at Queens Medical Center and authorities there disclosed that they had no record of that event. Subsequently, a change was made in the narrative alleging the birth place to now be Kapiolani Hospital. While this may be an oversight other discrepancy surfaced around the information visible on the .pdf file image released by the White House. The serial number shown on the image of the certificate, which purports on its face to have been imposed on the form with an automated sequential numbering stamp, is 61-10641. Investigators learned at that time, batches of birth certificates were collected monthly, ordered by date and time of birth, and then sequentially number-stamped in a special room by a single clerk trained for the purpose, to minimize numbering errors. Vital statistics will show that Susan Nordyke was born at Kapiolani Hospital at 2:12 p.m. Hawaii time on Aug. 5, 1961, and was given No. 151-61-10637, which was also filed with the Hawaii registrar Aug. 11, 1961. Gretchen Nordyke, twin to Susan Nordyke, was born at Kapiolani Hospital at 2:17 p.m. Hawaii time on Aug. 5, 1961, and was given No. 151-61-10638, which was also filed with the Hawaii registrar Aug. 11, 1961. Barack Hussein Obama II purportedly born at Kapiolani Hospital at 7:24 p.m. Hawaii, Aug. 4, 1961, and was given No. 151-61-10641, which was filed with the Hawaii registrar Aug. 8, 1961. Virginia Sunahara was born at Wahiawa Hospital at 9:16 p.m. Hawaii time on Aug. 4, 1961, and was given No. 161-1961-011080, which was filed with the Hawaii registrar Aug. 10, 1961. 1961 August 4, 9:16 pm – Virginia Sunahara was born in Hawaii, according to her current birth record. The serial number currently shown on Virginia Sunahara short form Certificate of Live Birth as that of her birth record is 61-11080. This registration number is 439 numbers after Barack Hussein Obama II. Some 17,578 births occurred in Hawaii in 1961 – an average of about two births per hour. Virginia Sunahara was born less than two hours after Barack Hussein Obama II stated time of birth, so that the number that ought to have appeared on her original birth certificate should have been not more than a dozen either side of Barack Hussein Obama II 61-10641. Virginia Sunahara registration number is inexplicably out of sequence by 439 numbers. Mr. Obama’s birth certificate was registered August 8, 1961. The Nordyke twins’ birth certificate was registered August 11, 1961. Even if the sequential numbering had followed the date of registration rather than the date of birth, Mr. Obama’s certificate should have been automatically assigned a number lower, not higher, than the numbers allocated to the certificates of the Nordyke twins. And the number currently assigned to Ms. Sunahara is entirely out of sequence. Investigators conducted an exhaustive search of all birth records announced in the Honolulu Advertiser and the Star Bulletin for the month of August 1961. There was no apparent consistency in the order or day with which each newspaper reported birth announcements, such that one or the other of the two newspapers would often lead or lag the other in the reporting of any particular birth. Some births were announced in one newspaper and not in another. Some births were not announced at all. Births to unwed mothers were omitted from reporting in either newspaper, even though Hawaii vital statistics report there were over 1,000 births to unwed mothers in 1961. A comparison of the Obama birth announcement in the two newspapers clearly demonstrates the announcements are identical in every detail, including the order of other birth announcements preceding and following the Obama birth announcement. We found the sequence of reported births around the reporting of the Obama birth was actually an anomaly for Hawaiian newspaper reporting in August 1961 because the sequence of births before and after Obama’s was one of the few birth sequences in the entire month that were identical in every detail, including the order of other birth announcements preceding and following the Obama birth announcement. Neither newspaper independently checked the truthfulness or accuracy of birth announcement information published by the newspapers from Hawaii Department of Health vital statistics records. Searching over a several year period, various researchers have found repeated listings of births to Japanese parents as being reported in the newspapers as Hawaiian births, even though the children were found to be born in Japan. These findings tend to reinforce what we learned on our visits to Hawaii: that it was then the widely-recognized practice in Hawaii, later regularized by statute, to certify foreign births to Hawaiian parents as Hawaiian births. In 1961, the Hawaii Department of Health appears to have used local area offices outside Honolulu as reporting centers where parents and other family members could represent children born to the family as Hawaiian births, without submitting any proof the child was actually born in Hawaii. This practice was also statutorily permitted. It is plausible that an original birth record of some type for Mr. Obama may exist in Hawaii. However, as noted elsewhere, our investigation has discovered that at that time Hawaiian law contained a specific provision that permitted a Hawaiian parent of a child born anywhere in the world or any adult purporting to represent that parent, the right to register the child as Hawaiian-born. It is for this reason that two entries in the “Births” column of the local newspapers at the time do not constitute evidence that Mr. Obama was born in Hawaii. They are merely evidence suggesting that a birth certificate of some type was issued for him in Hawaii, and they tell us nothing about whether or not he was born there. In particular they do not – as the White House document purports to do – identify the hospital of birth. Hawaii law permits various forms of registration and supplementation at later dates, with different information. The mere issuance of a birth record does not confirm the birth took place within the state of Hawaii or in the United States. If Mr. Obama had not in fact been born in Hawaii, the long-form original birth certificate would not have stated that he had been born in a particular hospital at a particular time, and would not have borne the signatures of the attending physician. The newspaper entries would have been identical whether he had been born in Hawaii or elsewhere in the world, but the birth records would not have been identical. The existence of this law permitting out-of-country births to be registered as though they were Hawaiian births is a further evidence that he newspaper announcements of Mr. Obamas purported birth in Hawaii cannot and should not be relied on as any evidentiary validation of the event taking place as depicted by the manufactured .pdf file image released by the White House. B Obama (Kenya) and Stanley Ann Dunham, President Obama’s alleged parents, did not live together as man and wife at 6085 Kalanianaole Highway in Hawaii, the birth address shown on the White House image as well as in the two birth announcements for Barack Obama Jr. published in local newspapers at the time. Both newspapers, the Honolulu Advertiser and the Star Bulletin, carried the announcement that Barack Obama Jr. was born on Aug. 4, 1961, to Mr. and Mrs. Barack H. Obama who resided at 6085 Kalanianaole Highway. Madelyn Dunham and her daughter Stanley Ann lived at 6085 Kalanianaole Highway. There is no evidence that B Obama Sr. lived there. Stanley Ann Dunham and Barack H. Obama Sr. lived at two different addresses after their marriage. Stanley Ann Dunham remained in the rented 6085 Kalanianaole Highway after her marriage. B Obama Sr, lived alone at an 11th Avenue address, closer to the university where he was a student. It is reported that Stanley Ann Dunham left Hawaii in August 1961, the month of Barack Obama Jr.’s birth, taking him with her but leaving her husband behind when she moved to Seattle to enroll at the University of Washington. Whether B Obama Sr. did not establish a residence with his wife and son in Hawaii is unknown, there is no listing in the Polk directories for 1961 – 1962 that documents Stanley Ann Dunham and B Obama (Kenya) as ever having lived at the same address. A search of the Polk’s Directory of Honolulu for 1961-62 indicates that 6085 Kalanianaole Highway was being rented by the grandparents, Madelyn L. Dunham, listed as a loan interviewer and escrow agent at the Bank of Hawaii, and Stanley A. Dunham, listed as a manager with Pratt Furniture. Much of Mr. Obamas early life remains a mystery and is only revealed to the public through an unsupported composite narrative. Instances exist where the narrative of birth or other reported life time events have been called into question and then the narrative is altered in an effort to clears up discrepancy, but absent of any documentation supporting the change in questionable facts. A thorough background investigation supported by the release of life time documentation would be necessary to strengthen the birth narrative should it exist as depicted to the public. However, investigators have been hampered by the refusal of Mr. Obama to release any of his past records should they exist. Original, long-form 1961 Hawaiian birth certificate.